The long-billed curlew (Numenius americanus) is a large North American shorebird of the family Scolopacidae. This species was also called "sicklebird" and the "candlestick bird". The species breeds in central and western North America, migrating southward and coastward for the winter. The long-billed curlew is the largest sandpiper of regular occurrence in North America. It is 50–65 cm (20–26 in) long, 62–90 cm (24–35 in) across the wing and weighs 490–950 g (1.08–2.09 lb). Its disproportionally long bill curves downward and measures 11.3–21.9 cm (4.4–8.6 in), and rivals the bill of the larger-bodied Far Eastern curlew as the longest bill of any shorebird. Individuals have a long neck and a small head. The neck and underparts are a light cinnamon in color, while the crown is streaked with brown. This species exhibits reversed sexual dimorphism, as in many sandpipers, the female being larger and having a much longer bill than the male's. 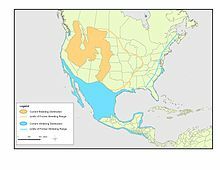 The breeding habitat is grasslands in west-central North America. The species displays an elaborate courtship dance, with fast and looping display flights also being common. A small hollow is lined with various weeds and grasses to serve as the nest. The species is a determinant layer, a characteristic of shorebirds, laying four eggs, which vary in hue from white to olive. Long-billed curlew young are precocial, the chicks leaving the nest soon after hatching. Though both parents look after the young, females usually abandon the brood to the male 1–3 weeks after hatching and depart for winter grounds. Adults whose nest fails often depart immediately (or nearly so) for winter grounds. Long-billed curlews often feed in flocks. Using the long bill, an individual probes the mud or other substrate for suitable food. The usual food consists of crabs and various other small invertebrates. The species also feeds on grasshoppers, beetles, and other insects. This bird has been known occasionally to eat the eggs of other birds. The population was significantly reduced at the end of the 19th century by hunting, though numbers have rebounded somewhat in more-recent times. The species was formerly classified as Near Threatened by the IUCN, but new research has confirmed that the long-billed curlew is again common and widespread. Consequently, it has been downlisted to Least Concern status in 2008. Candlestick Point in San Francisco was named after this indigenous bird, and subsequently Candlestick Park stadium inherited the name. The species had dramatically declined in the San Francisco area by the early 20th century already, being "practically extinct" in San Mateo County in 1916. By the time the stadium was constructed in the 1950s, there was no remnant of the huge, local flocks of "candlestick birds" left. ^ Mowat, Farley (1984). Sea of Slaughter (First American ed.). Atlantic Monthly Press Publishing. ISBN 978-0871130136. ^ "Long-billed curlew". All About Birds. Cornell Lab of Ornithology. ^ Hayman, Peter; Marchant, John; Prater, Tony (1991). Shorebirds. Helm Identification Guides. Christopher Helm. ISBN 978-0713635096. ^ a b Allen, J. N. (1980). "The ecology and behavior of the Long-billed Curlew in southeastern Washington". Wildlife Monograph no. 73. ^ Jones, Stephanie L.; Nations, Christopher S.; Fellows, Suzanne D.; McDonald, Lyman L. (2008). "Breeding abundance and distribution of Long Billed Curlews (Numenius americanus) in North America" (PDF). Waterbirds. 31 (1): 1–14. doi:10.1675/1524-4695(2008)31[1:BAADOL]2.0.CO;2. ^ "2008 IUCN Redlist status changes". BirdLife International. Archived from the original on 14 September 2008. Retrieved 23 May 2008. ^ a b "Candlestick Park". Ballparks.com. Retrieved 3 October 2006. ^ Littlejohn, Chase (1916). "Some unusual records for San Mateo County, California. Abstract in: Minutes of Cooper Club Meetings" (PDF). Condor. 18 (1): 38–40. doi:10.2307/1362896. Wikimedia Commons has media related to Numenius americanus. "Long-billed curlew media". Internet Bird Collection. Audio recordings of Long-billed curlew on Xeno-canto.